I am sure you have all heard about the big sale going on at TpT today and tomorrow. I have already purchased some goodies and plan to use them in my classroom soon! 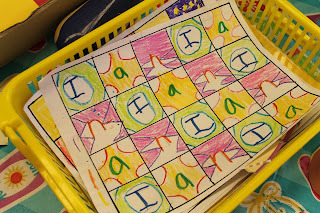 Now that things are settling down in my classroom, I have some time to share more of the activities going on in class. This week we worked on our Surf Buddies and they have turned out really cute:) I need to get them all hung up and ready for our Open House in two weeks!! 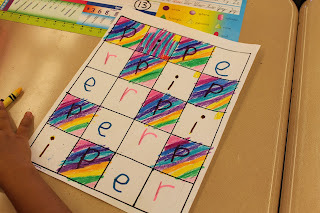 Another Back To School activity that I do is a Name Pattern for math and art. 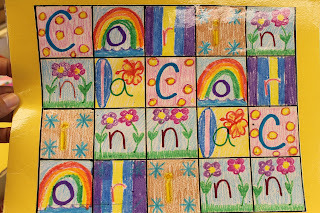 My students do this each year and we use them to cover our cubbies. We start with a basic 5x4 grid. 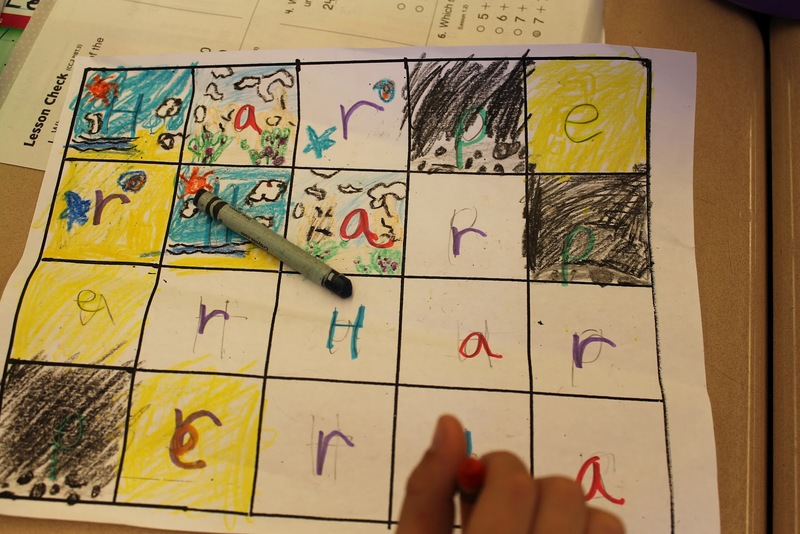 They write their name in pencil in a repeating pattern on the paper. If their name has 5 letters then we turn the paper and use the 4 across. If they have 4 letters we make sure they use the 5 across. 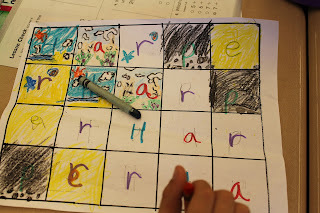 Then they decorate each letter of their name in a different way. All the a's are red or all the t's are blue with polka dots. I encourage them to add lots of details and make it colorful, no white! It takes lots of time, because you will have 1 or 2 students who will make mistakes! Make plenty of extra copies. Once they get that it makes a pattern it will go much smoother. This is a great second and third grade activity, first grade might be a little tougher. After they are all colored in I mount them on construction paper and laminate them. Just click on the pic below to grab this in Google Docs. Finally today I have a freebie for you Daily 5/Cafe teachers out there. I am not using the Cafe yet, but I had a nice teacher ask if I could make The Cafe Reading Strategy Cards to match everything else I had done. I made this and they turned out really well. These are great strategies no matter what reading program you may be using. Just click on the picture to download them for free in my TpT store. If you are back to work I hope it is going smoothly for you. If you are still on vacation enjoy it!! Very cute Jen!! I need to do a glyph as well, its on my list!! We always start off the year with Patterning, your name quilts are a great idea :). I still have 3 weeks of holidays to enjoy but have gradually started a bit of school stuff....love the lazy days. I love you reading strategy cards. I just just started looking into CAFE, so I'm hoping to use them soon! 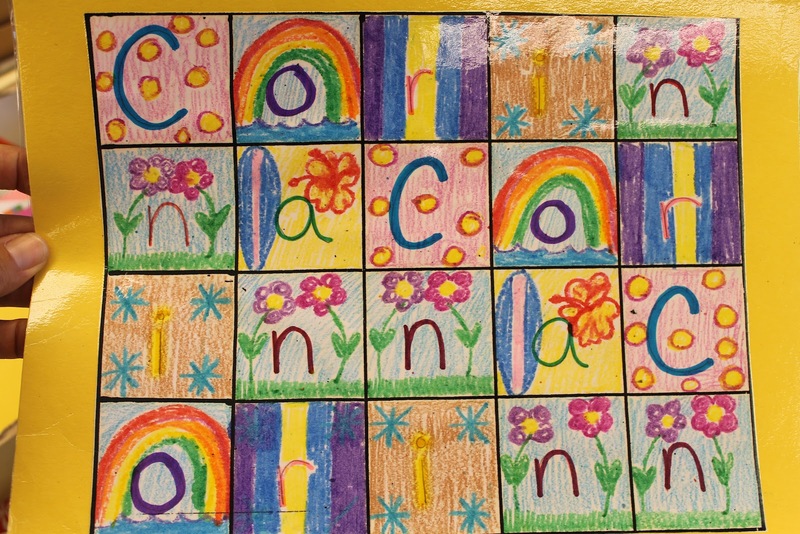 We sometimes do the name pattern art, too. They always look so great! Yours are very pretty.